Americans are moving less, although the reasons aren't clear. The US Census Bureau has just released an updated set of tables and graphs showing the trend. For example, here's the overall pattern. The blue bars show the total number of movers (measured on the left axis) while the black line shows the mover rate relative to population (measured on the right axis). Although moves of all types have declined, the number of short-distance moves within a given county has fallen somewhat more. number of relatively short moves, under 50 miles, hasn't fallen much. It's the longer-distance moves that have fallen. 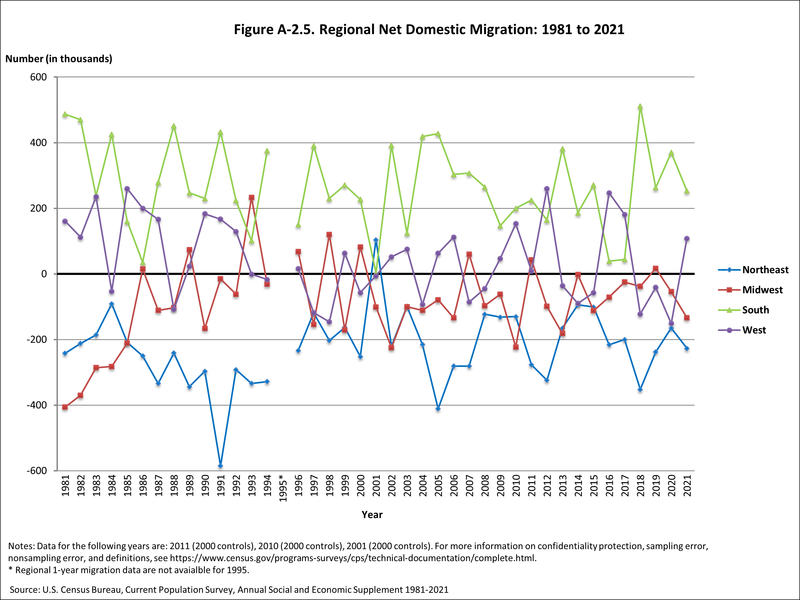 I also thought the regional pattern of net domestic migration was interesting. The Northeast has consistently been losing population to moves; the South has been consistently gaining; and the West and Midwest as a whole have been roughly breaking even. 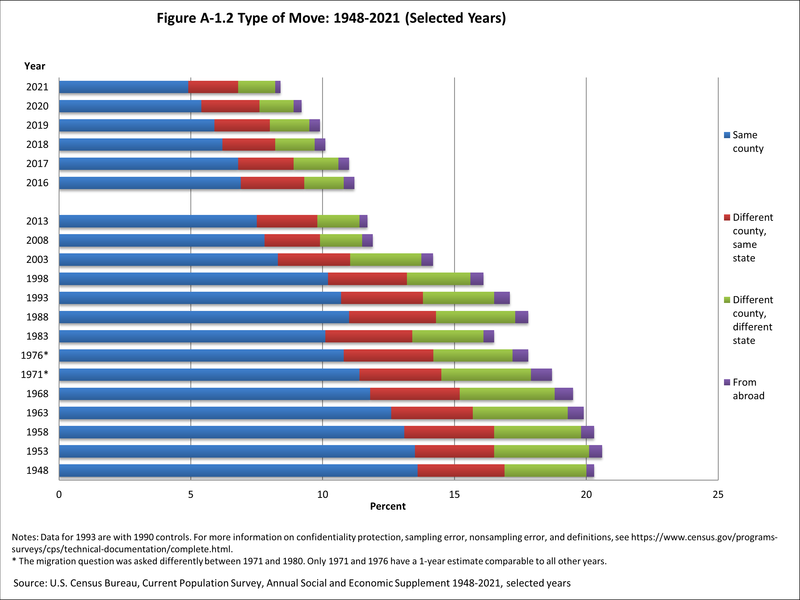 The reasons for this decline in mobility are not clear. A good explanation needs to explain a long-term trend--that is, pointing to something like people who didn't want to move after the drop in housing prices in 2008 can't explain a pattern that has been going on for decades. Moreover, most common explanations are easily tested. For example, if the reason for declining mobility is the US population getting older, then younger households should be continuing to move at the same rate, which isn't actually true. For an overview of the research on this topic from a few years back, Raven Molloy, Christopher L. Smith, and Abigail Wozniak wrote "Internal Migration in the United States." in the Summer 2011 issue of the Journal of Economic Perspectives. For example, they write: "Migration rates have fallen for most distances, demographic and socioeconomic groups, and geographic areas. The widespread nature of the decrease suggests that the drop in mobility is not related to demographics, income, employment, labor force participation, or homeownership." 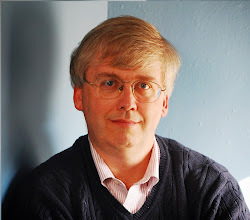 About a year ago, David Schleicher discusses the issue in "Stuck! The Law and Economics of Residential Stagnation," appearing in the Yale Law Journal (October 2017, 127:1, pp. 78-154). (I discussed the article here.) He argues that a wide variety of local and state rules and regulations have combined to make movement more difficult: like limits on residential building that drive up the price of housing and rules requiring state-level occupational licenses for certain jobs. The question of why US mobility is falling can be rephased in this way: Why don't we see more movement from areas with lower wages and fewer jobs to areas with better economic prospects? It used to be that US regions with lower income levels had faster growth, and thus tended to converge with the rest of the country. But regional convergence has now slowed down dramatically, or even stopped. I'm not sure what might best be done about the decline in mobility, but it seems to me a legitimate public concern. It's bad for an economy when labor resources are not being reallocated to areas where they would be more productive. In addition, less mobility means that people have less shared life experience with others across a range of neighborhoods, communities and regions.